Preheat oven to 325 degree. Line a rectangle 9″x13″x2″ cake pan with parchment paper. Combine cocoa powder and cake flour. In a big bowl, beat egg yolks and sugar with a ballon whisk until sugar dissolves and the mixture turns fluffy and pale color. To the yolk mixture mixture, add in melted butter, milk, vanilla extract and salt. Mix well with the ballon whisk. Sift flour mixture over the yolk mixture in 3 batches, mix well after each addition. In a stand mixing bowl, whip egg whites and cream of tartar until frothy, gradually add in sugar, one tbsp at a time. Continue whipping on high speed for 1-2 minutes. Scrapping down sugar on the side of the bowl with a spatula. Turn down to medium low speed and whipped until peak forms. Add 1/3 of whipped egg whites to e yolk mixture, whisk to mix well. Then gently fold in remaining egg whites in 2 batches. Pour cake batter to the cake pan, smooth the top. Bake at preheated oven for 20 minutes. 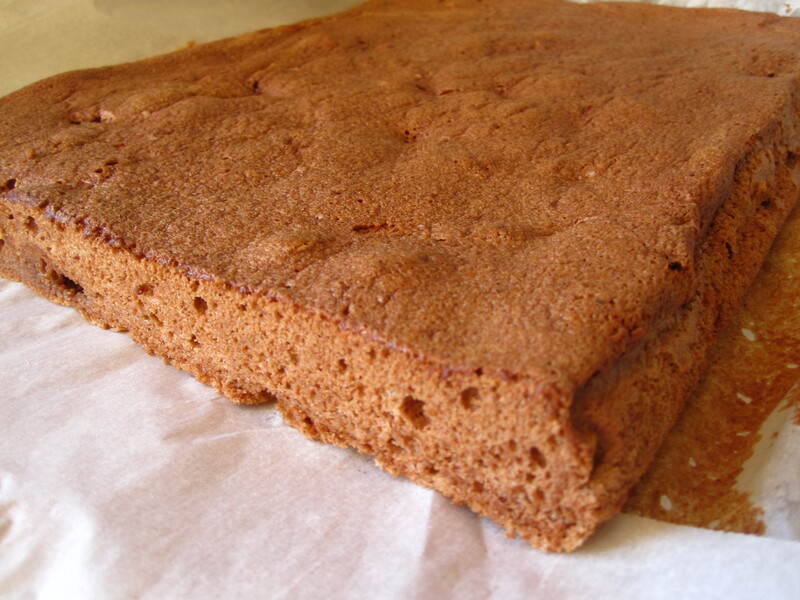 Cool the cake in parchment paper on the rack. I noticed after the cake cools, the beautiful top gets stickier and stickier. Why? This cake can be rolled up and becomes a chocolate swiss roll. I didn’t want to deal with whipping the cream for the filling, and my kids totally didn’t mind it at all! 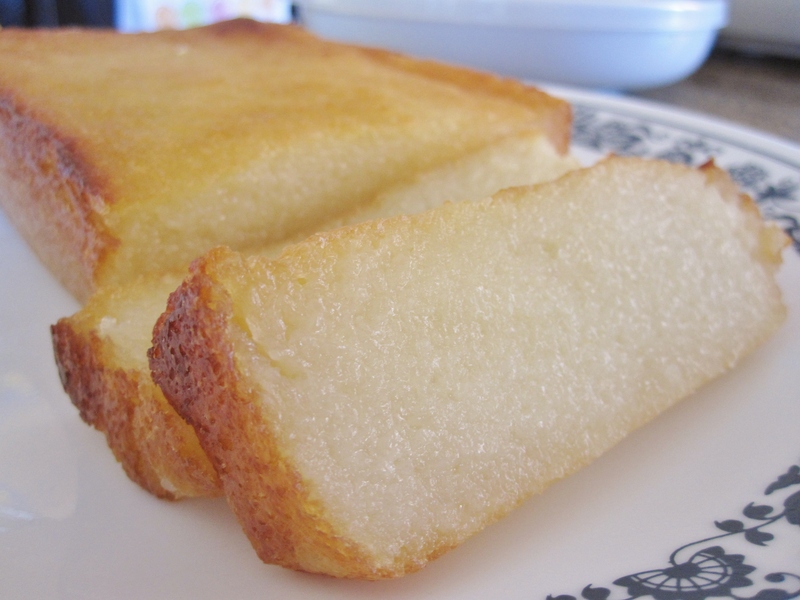 I like cassava, whether it’s plain and dipped in coconut cream/sugar or steamed cassava cake, or in this case, baked. In Malaysia, there are yellow flesh cassava which tastes more fragrant. However, the only fresh cassavas in the Asian grocery stores are always white flesh and coated with a thick coat of wax on the skin. Not sure if it’s true but I read somewhere on the internet that white cassava sometimes taste slightly bitter than the yellow ones. 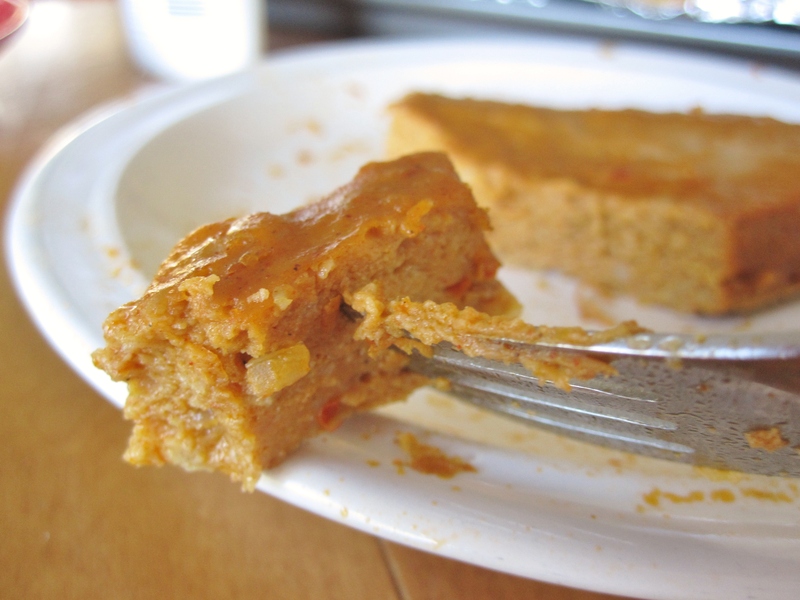 Anyhow, back to my bake cassava cake– this cake is pretty easy to make. I strongly suggest grating a fresh cassava instead of those pre-grated frozen ones. It requires more work but you can really taste the cassava flavor if you use fresh ones. I love the crust of the cake and the buttery aroma. Preheat oven to 375°F. Grease a loaf pan with cooking spray. Peel off cassava skin (including the whitish inner skin). Grate cassava into a bowl and discard the inner fiberish core. Add a little and water and squish it with you finger. Squeeze out excess juice. Boil water and sugar in a small sauce pan until sugar dissolve, melt in butter. Pour butter mixture into grated cassava, mix well. Beat egg into coconut milk to blend well. Then pour coconut milk mixture into cassava mixture, stir to combine. Pour the mixture into a loaf pan. Bake at preheated oven for about 1 hour, until toothpick test comes out clean and the top is golden brown. In a big sauce pan, fry garlic and shallot with 6 tbsp of oil until aromatic. Add in remaining spice paste ingredients. Stir to mix well. Set aside to cool completely. Add all other ingredients into the sauce pan. Stir to blend well. Pour the mixture into a greased shallow pan, smooth the top. Steam on high heat for 10 minutes. Serve with steam rice. Fish paste: different brand of fish paste does make otak-otak taste differently. 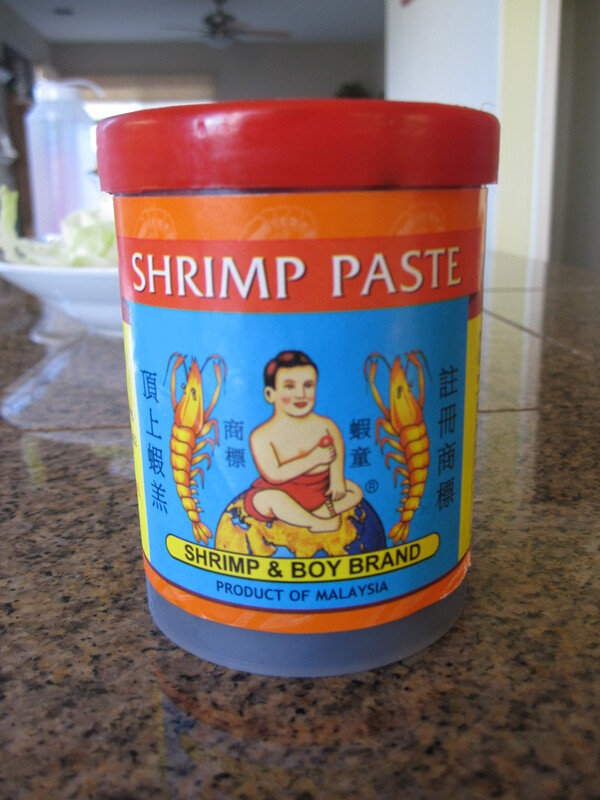 I prefer 佳发brand (see picture below)– it is frozen and can be found in Asian grocery stores. I tried 味全brand frozen fish paste, but found it is not good for making otak-otak. (1/31/12 update: I have bought 佳发brand frozen fish paste a couple of times later but they were bad both times, which was disappointing. 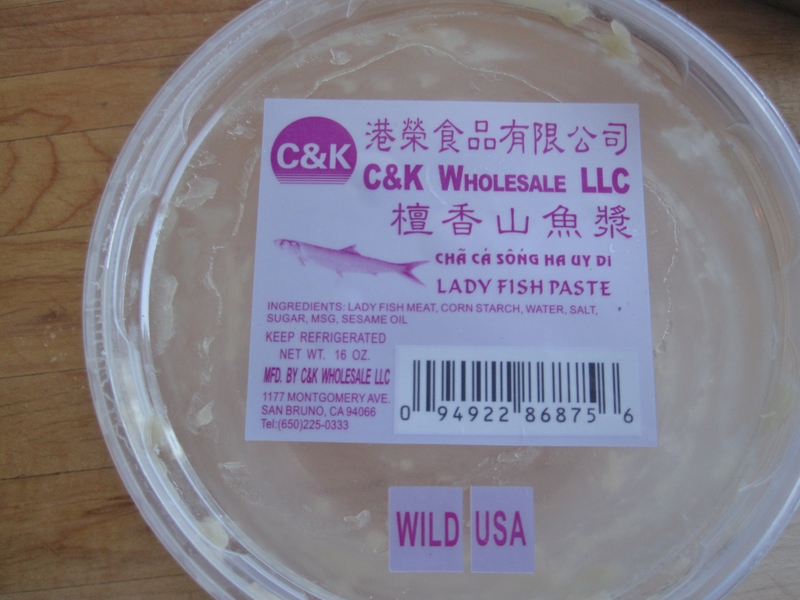 I now use 港榮 brand fresh lady fish paste (see bottom picture). This brand is available at 99 Ranch Market, under packaged fresh seafood section. This is a peppery soup that for sure will warm you up during cold winter days. 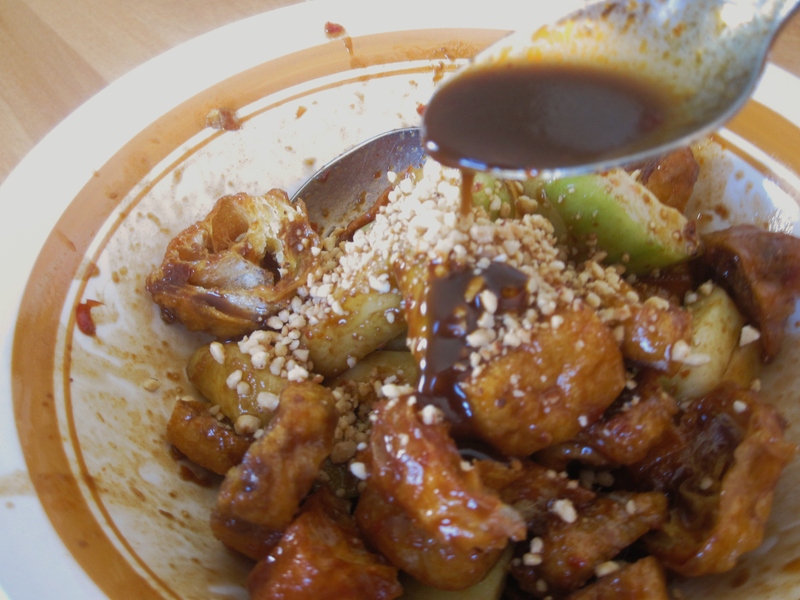 My mom taught me how to clean and prepare pig stomach– after cleaning, we partially cook in a dry wok until the surface is a little brown, and thus enhance the flavor. Usually restaurants don’t do the browning step, but it does make a difference in taste. If the pig stomach scares you, just use peppercorns with spare ribs or even chicken, and becomes peppery chicken soup. Add water and crushed peppercorns to a deep pot and bring to a boil. Let it boil for several minutes so the flavor of peppercorn comes out. Meanwhile, blanch spare ribs in a separate pot. Remove ribs and wash off any impurities. Add ribs to the deep pot. Cover and cook on high heat for 15 minutes. Turn heat down to medium, add pig stomach. Continue cooking for another 2- 2.5 hours. Add more water if necessary. The soup should look cloudy at this point. Add salt to taste. 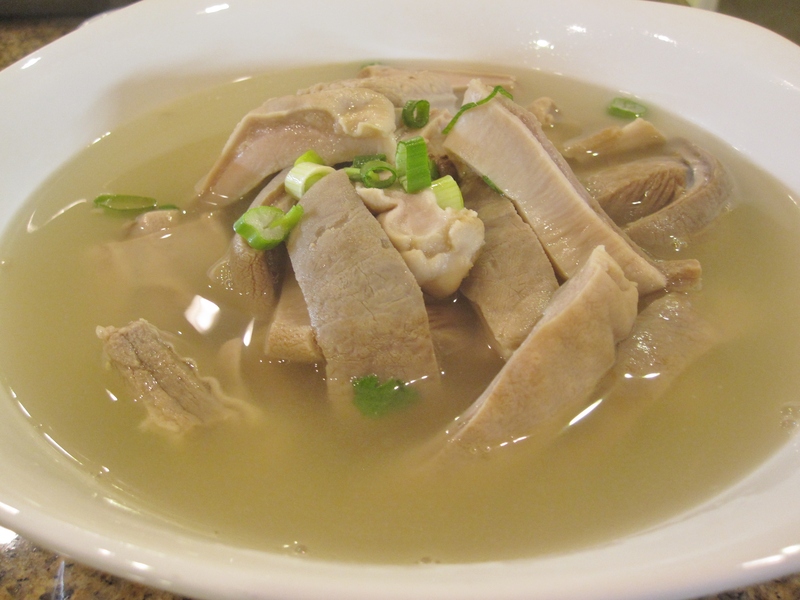 Before serving, cut pig stomach into strips. Wash pig stomach briefly and trim off any fat. Sprinkle generous amount of salt all over pig stomach, rub it with your hands. Then sprinkle generous amount of corn starch/ tapioca starch and rub with your hands again. Then use a knife to scrap off the pig stomach inside and out. Pay attention to parts where there are folds and scrap it good. Rinse well. If after rinsing the pig stomach still feels very slimy then repeat this step. It’s okay though if it feels a little slimy. Make sure the inner side (the side that looks like skin and has folds) is facing out. Drain. Heat up a dry clean wok on high heat. With the inner side out, put pig stomach to the wok– it will make a very loud noise due to water contact with high heat but don’t worry. Liquid will start to draw out for the first few minutes. Discard the liquid so the wok remains dry. Brown the surface of pig stomach, pressing down with a spatula on the parts that have folds, to prevent shrinking and promote browning. Pig stomach will stick to the wok so move it around from time to time. Flip over and brown the other side. Wash pig stomach and scrap the “skin” with a knife again. At this point the pig stomach should not feel slimy at all. Drain and it’s ready to use or keep in freezer. Please note pig stomach is only PARTIALLY COOKED and requires further cooking.